Recently a new moderator starting helping out at the blog I moderate. On his very first day, he moderated me. ME!!!!!!!!! How dare he! I was so furious that I emailed the blog owner and told him I was taking a break from moderating his blog and then I turned off all comment notifications from this blog. About five minutes later I turned them back on again. Then I shed a tear or two because I don’t really want to abandon this particular community especially over something so trivial. I was right, I promise 😉 So when I saw that I was unable to express my thoughts on the matter I returned to my own blog and expressed them here. This is what prompted my recent post about autism which is essentially what my comment was about. All I can say is thank heavens for my own blog. Everyone should have one. Posted in Journal and tagged blog, blogs, comments, moderation, moderator. Bookmark the permalink. bwuuahahaha. I once accidently deleted my own comment on my own blog……I was drunk. Did you reinstate the comment after sobering up? sobering up? that does happen occasionally. He moderated me too! Twice! The brass neck of the man! I think we should set up a little whiny clique and complain nastily (like the other side does on Twitter). Or on second thoughts, perhaps not. I’m glad you felt able to come back. I used to work as a technical author/editor. One did not alter another persons work, but sent it back with recomendations. Editors/moderators being asked/allowed to moderate each other is bad form. You had every right to feel agrieved. May I suggest molesting an inanimate object. 😛 or two. Haha! I think I sent him a few angry emails. That helped. If Willard had his own blog, I seriously doubt it would get much traffic. Why Anders finds an increased focus on such material to be of interest is a mystery to me. Maybe just perturbing the experimental conditions? Anyway, the blog, while it still does have some interesting science discussion from time to time, had started to go in circles well before this latest turn of events. When I first started following and participating in it, I was interested to see if a non-climate scientist with no (apparent) history of activism would be able to bring himself to the next logical step and start to at least talk about how to grapple with the problem, perhaps even followed by some actual grappling. Not so much, it seems. Even when it comes to the science, I found the lack of interest in earth system sensitivity (the one that really counts) relative to the kinds that allow non-experts to do simple calculations to be illuminating. I’d like to see more discussion on policy too! I really would. I think AndThen is hesitant to get too involved with this but there’s no reason why we can’t still start some discussions. In fact, if you’re interested in writing a post about this or about earth system sensitivity then I’m sure that would be fine. Especially given that there will be no posts for a couple of weeks. I can publish it for you. Thanks for the offer, and I will think about it, but there remains the concern about Willard’s moderation. A policy discussion I would see as interesting might cross his line pretty quickly. If you write a post you could request that the comment stream be unmoderated by Willard. I don’t think he’ll mind. Although, maybe just put up a post featuring one or both of those linked studies? Since it involves little writing effort, I’d be willing to do that (or you could). Maybe add this, which I linked in a comment there a couple weeks ago and got no response on (other than a one-liner from BBD to the effect of “What? Activism? Here?”). Ah, OK. I’ll put something together then. Yes, if you write something then I can publish it. It doesn’t have to be much but it would better to have a little more than just links. Just to add that even if my interest in the content of the blog wasn’t flagging, not being clear as to when I may or may not be moderated isn’t amusing. It seems like a rather juvenile game on Willard’s part. I just pointed to this over there. In a broad sense, how does this not mean that “playing the man” is necessary to dealing with the problem? But Willard also not being any sort of activist, I suppose that’s not his problem. I see what you mean and I don’t really understand either. In fact, I don’t really get the whole “climate ball” thing so I stay out of those discussions. If you had bothered to intervene on behalf of so many of the people from the other side who were snipped and stonewalled by Mr Physics, you wouldn’t have had to contend with a situation where the same thing was being done to you. Moderation kills conversations. Sadly enough, many people learn of death only when it happens to them, i.e., they are happy as long as they can hear themselves speak. Nice try, Shub, but I’m definitely not feeling your pain. But I see yours, mate. Subtlety is lost on Shub, so I’ll be more clear: I haven’t had a comment moderated by Willard. My concern is prospective. I have had one or two comments moderated in the past at ATTP, by Anders or Rachel, although IIRC most or maybe even all of those were because they were replies to deleted comments. The issue with Willard is that he’s been unable to express very well exactly what he means by “don’t play the man.” I find that frustrating because I don’t want to have to be speculating about where the line is while drafting comments. You, on the other hand, were multiply moderated for being just plain nasty or for repetition of refuted denialist memes. Certainly “playing the man” includes overt nastiness, but Willard clearly has something more in mind. The other issue with Willard is that he’s essentially asserting that he knows best what is the most effective mode of argumentation, but AFAICT he bases that on academic formalism rather than experience in the real world trying to advance a policy. I don’t mind him asserting that, I even find it an amusing and sometimes stimulating exercise, but I don’t want to have to comply with it. Also, note that I said I was already starting to lose patience with Anders’ wheel-spinning. But if he closes the blog down or I just decide to stop participating, I will lose no sleep over it since I have plenty of other places to exercise my intellect with regard to climate. True, so at the risk of being painfully obvious, but nb. Shub, my first comment on this thread was tongue-in-cheek.That’s why I didn’t post any “hey, ref!” comments at ATTP and that’s why I didn’t contact Willard and bend his ear. Rachel will be able to check with Willard and confirm that this is true. Rachel will also know that I never questioned her moderation of my comments either. This is very interesting and I’ll have to think about, but one way in which the Israel-Palestine conflict differs from climate change is that most everyone at least says they want peace and thinks it would be a good thing. I’ve just read this and it is interesting. How could it be applied to climate science? Many of the views Skeptics hold are already absurd and often inconsistent views: we can’t deprive poor people of access to cheap fuels but we can deprive them of land (I’m thinking of sea level rise here); models are wrong except when they’re Richard Tol’s economic models. The most absurd one of all is that climate scientists are in on some elaborate hoax to further their careers (unless the scientist is called Roy Spencer or Richard Lindzen). It’s completely ridiculous and I’m not sure what you can do about people who think this except to ignore them. Any further low you can sink? You got snipped at a blog *you* used to moderate. You experienced the pain of someone treating your words like trash. So, in response, you delete comments at your blog? Let me cure something here. Journalist Keith Kloor called Deltoid (the blog) a ‘sewer’. His words not mine. Deltoid, an unmoderated ‘blog’ that lacks an author (yes) is BBD’s favourite hangout. It has been so for the past couple of years – roughly the period during which the blog has lacked an author. After secreting away in relatively stress-free conditions for a long time, BBD found it possible to slowly work his way back discussing climate issues on a blog you moderated – with the given ignorance of history, background, temperament and the people. The reason he thrived was his opposition to people who were against your, and Mr Physics’ positions, and little else. Try to know what’s being said before rushing to your delete key. Even if Kloor were a good journalist, this demonstrates precisely nothing about BBD. With regards to being moderated myself, I over-reacted. I didn’t say anything contentious in my deleted comment. Did you read it? It was only deleted because it referred to a deleted comment and others felt this comment was abusive. I disagreed. I still do but I’m over it. That’s all there is to it. I don’t see how what Keith Kloor thinks of Deltoid is relevant. I didn’t feel your comment was very nice so I deleted it. I stand by my decision. As long as commenters at AndThenTheresPhysics stick to the moderation policy when they comment there, they are still free to comment at other places on the web and whether or not these other places have a moderation policy is not my concern. Really? Since when is being nice a prerequisite for being able to comment on blogs? And the comment was *not* even anything to say about BBD. It was about him commenting at places other than what someone else referred to as sewer. You did not over-react. You expressed what your felt given your own background and knowledge. That is completely valid. I saw the commenter calling someone else ( I forget who and who) autistic. Since when did that become an acceptable abuse term in adult conversation?!! Again, this doesn’t mean you snip the comment out of political correctness but only that you register disapproval. If I can get over being moderated then I’m sure you can too. It’s really no big deal. I don’t have a moderation policy on my own blog, but I’d like commenters to respect the other commenters. I did not get that from your comment, which is why it was deleted. You got that meaning from my comment because you did not understand it. You can delete my comments. If I cared more about protecting my comment text or focused only on disrespecting others I would not be here interacting would I? BBD could think about it too. Shub, I’ve just gone back and re-read your first comment – which is still in my inbox – and it’s completely unacceptable. How does it feel to come out into sunlight after wallowing amongst sewer trash …. It doesn’t matter that I don’t know what site you’re referring to? It could mean anything. If you’re going to quote someone else, then typically you would say something like “How does it feel to come out into sunlight after wallowing amongst what Keith Kloor refers to as “sewer trash””. And then you would provide a link to the source of the quote. NB: I have no idea whether Keith Kloor actually said this. I no longer pay attention to Kloor and don’t recall the specific incident (in part because it wasn’t the only such), but during the relevant timeframe he was indeed in the habit of sayiing such things. Oh for goodness’ sake grow up will you, Shub. Shub (who was banned by Keith) either doesn’t know or is deliberately omitting that for two years I was a regular, even prolific commenter… at Keith’s. I only stopped when he switched to bashing anti-GMO activism, which is boring. I suspect Orwell might agree that an academic philosopher might never have to confront a solid reality. OTOH Willard is apparently young enough that he may live long enough to see some of the nastier climate impacts, although I suspect that if he does he’ll have no problem rationalizing away having avoided playing a role in trying to mitigate them. Anyway, re a possible post, I’m starting to have my doubts since it seems very likely that this is exactly the sort of behavior Anders expected from Willard. It’s arguably interesting to watch from a purely intellectual standpoint, but it seems to me to be a conscious step backward rather than forward. Probably I shouldn’t write one if I no longer feel otherwise welcome at the blog. Any variation of “you’re in denial” plays not the ball, but another player’s psyche. Even if it was true, it would not justify you making the argument. This is not a psychotherapy session, nor is it an “intervention” from dear friends. You’re no psychologists. If you were, you’d get radiated from your order, as one does not simply provide an on-line diagnostic, certainly not the way you do. — was not only wishful thinking, as I showed by pointing to a directly contrary example, but rather nasty in tone. You should apologize to all involved, but I rather expect you’ll just delete this comment too. Out of curiosity, is an intended consequence of your moderation of this blog to convince people like me that it’s no longer worth participating here? If so, you’ve made some giant steps in that direction. For goodness sake we should be discussing one of the most serious and most damaging problems to affect our continued existence. It is not a game! Please stop this nonsense and get back to discussing the science. I’m sure I am not the only person who is disturbed by the direction this blog is taking. It is only giving the “sceptics” ammunition to show how pathetic we scientists are since we just “play games”. Willard, AFAICT you are *solely* here to tone troll. Interesting I might think so, isn’t it? Probably it’s because your commenting history evinces much interest in tone and little or none in the science (or even in policy). But prove me (and Ian, and I suspect plenty of others) wrong: Close these now-utterly-pointless threads and put up a science thread, or at least a policy thread. IMO that’s just an argument for not dwelling on the point with regard to an individual. Do identify the problem, but then move on. Also, as you know well, there’s a considerable body of social psych work that focuses on denial. Is all of that verboten as far as you’re concerned? Is that why you deleted my quotes of/references not just that nice young psychologist but Krugman and Orwell too? Oops, I seem to have been blocked, for the moment anyway. Could you approve that one, Rachel? I’ve just written a post at AT’s. Hopefully this will take the discussion away from moderation and onto something more important like climate change. at danger of making things worse, I think Willard is broadly correct, even though he’s deleted some of my comments, and also IMHO changed the meaning of others through snipping. – we all spend too much time arguing with “sceptics”. If you’re going to do that, it’s worth thinking about how you go about it, and even more importantly why. – making the point that blogospheric argument is a game, not reality, is valid. Rachel has chosen to try to move on to reality, at ATTPs, which is better. Since when is being nice a prerequisite for being able to comment on blogs? Personally, I think “being nice is a prerequisite for commenting” would be an excellent moderation policy. Yes, VTG, I probably agree with you except for the bit about it being a game. I have never really understood climateball and so I choose not to engage in those discussions. I also disagree a bit with Willard’s moderation decisions (as is quite evident already) but this is probably because I don’t really understand his rules. I definitely agree that it’s not worthwhile arguing with Skeptics. I think it’s a waste of time and would like to see less talk about moderation and more talk about climate change. I’ve been thinking about being nice as a moderation policy and I think it’s a wonderful idea so I’ve made it mine. Thank you Shub and VTG. Awesome moderation policy – you rock! I have never seen you comment outside the protected confines of AndyPhysics’ blog. Maybe you comment at Curry’s blog, I don’t know. What occasion would you have had for not being nice? “Be nice” sounds like an excellent ‘policy’. ‘Be nice’ should not be mandatory. How do people express (a little bit of) anger and frustration? Being nice is easy when you’ve sanitized your blog and driven away differing opinions and voices. All that’s left is badger, jsam, …etc and the handful of the same commenters *with whom the mod finds getting along easy, and who did not get along with those who were chased away*. In other words, an echo-chamber. 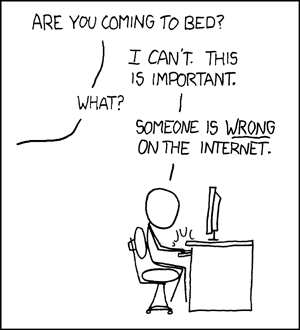 In my experience, the more unpleasant the commentators, the more of an echo chamber blogs become, not the opposite. Echo-chambers are created when one type of commenters’ unpleasantness is considered OK but the other types are not allowed. Agreed, but that in itself demonstrates why Willard is wrong. He is entirely about the form of argumentation. I think that may be the point; that continuing to argue without addressing the how and why merely condemns you to doing the same forever, and in a way which doesn’t actually advance the action you wish for. A neverending argument, one might say. Yeah, I’m done interacting with Willard, although probably I should note that he removed Tom C’s entirely polite comment saying that he wouldn’t be participating further under the new regime. That one surprised me given Tom C’s record there. Tom C out? And comment deleted? This is getting a touch out of hand, IMO. Oh, did it Steve? I participated there for close to a year and theresphysics blocked me for a joke. Theresphysics is buddies with the Skepticalscience crowd and functioned as an outlet for members of a non-cross hybridizing gated community of another kind, when compared to Deltoid. Willard’s stint may not be sustainable. and theresphysics blocked me for a joke. This isn’t strictly true Shub. IIRC you were eventually – some might say belatedly – blocked for being consistently unpleasant. Yep, now it looks like JasonB as well, along with a comment of mine responding to a rather petulant Wiilard comment (paraphrasing: “behave the way I want or the blog gets it”) which has now itself been removed. I’m ceasing too care much about all of this, but I must admit I’m curious as to the arrangement Anders made with Willard. Any enlightenment as to that, Rachel? I don’t think there’s any arrangement. It was just as AndThen said – a bit of an experiment – and I don’t think it’s permanent. Which comments are missing? I thought Willard had released them all. I can’t see any in pending or in the trash. Were they on the ClimateBall thread? It looks like Willard has now let through the above-referenced comments and some others. And Anders now says it was all just an experiment. As an apparent experimental subject not having been informed in advance that I was in one, that makes me feel a little meh. Now I’m wondering even more if Willard has a paper in mind. I think Willard’s post about Play the ball was meant to be informing everyone. In fairness to AndThen, it all happened just as he went on holiday. They’re all back AFAICT, although I wasn’t keeping close enough track to know for sure. That’s good. He said he was putting them all back. In fairness to Willard too, it’s hard to be a moderator and he put a lot of effort into it. He just wanted to be strict and consistent with his rule to play the ball only. He really wants people to argue effectively. But I prefer a more relaxed dialog and so I don’t agree with his moderating decisions, but it was interesting to see nonetheless. I agree with the interesting, but would draw the line at useful. Okay, I’ll try and clarify things a little before I go back on holiday 🙂 Firstly, as I thought Willard’s post made clear, there is a lot of playing the person in comment threads, rather than playing the ball, so it seemed interesting to see (as I thought WIllard’s post made clear) if it were possible to moderate a comment stream so as to encourage more playing the ball. I thought maybe we’d all learn something. In fact, we probably have. When I used the term experiment, I didn’t mean experiment on the commenters as such, I just meant an experiment to see if it were possible to moderate in such a way as to encourage people to make their point robustly while still focusing on the ball. It seems to have not worked, but it seemed worth trying. I’d like to say that I gave this a lot of thought before trying it. I didn’t really. It seemed like an interesting idea and so thought, why not? Why Anders finds an increased focus on such material to be of interest is a mystery to me. Maybe just perturbing the experimental conditions? Anyway, the blog, while it still does have some interesting science discussion from time to time, had started to go in circles well before this latest turn of events. Yes, it has rather. Not quite sure what to do. It’s hard not to do so when you’ve written almost a blog post a day for over a year. Slow down is probably the thing to do. Again, true. I’ve actively tried to avoid grappling with policy options for two reasons. Firstly, it’s my view that a better acceptance of the scientific evidence is the first step to a better understanding of the viable policy options. Being a scientist, I thought I made be able to help with that. Not sure I can though. Secondly, I don’t really have any better idea of what is viable from a policy perspective than anyone else (or, maybe, I have less understanding than many). Starting to discuss how to grapple with the problem, then means moving into an area with which I have little experience. It doesn’t mean I won’t do so, but I have been somewhat avoiding it intentionally. I participated there for close to a year and theresphysics blocked me for a joke. FWIW, BBD’s summary is pretty spot-on. Let’s also remind ourselves of your supposed joke. It went something like (and I paraphrase) “Ha Ha. That’s silly. You’ve just shown that something’s impossible”, the response to which was “yes, that was the point. Please explain why you think it amusing.”. Personally, someone mocking someone else for correctly showing what they were trying to show is more irritating than amusing, and tends to illustrate that the person doing the mocking hasn’t bothered to understand what’s being illustrated (of course, having seen you in action for more than a year, it’s very clear that actually understanding things is not high in your list of priorities, so I probably shouldn’t have been surprised). I also fully understand why you would object to a moderation policy that included “Be nice”. Me, I think that’s quite a good policy and maybe I’ll add it to mine too. Physics, you can keep me banned, that’s OK. But you should be able to make an effort to understand what I said. Surely, at this stage, it cannot harm anyone? Whatever harm was meant to be has already taken place. Salby claimed that owing to various processes (paraphrasing) a temperature increase will cause an increase of atmospheric CO2. You tried to show that an increase in temperature cannot produce enough of an rise in atmospheric CO2 from oceans giving up their dissolved CO2. I agree with you!! But your rebuttal would be complete only of addition of dissolved CO2 was the only mechanism by which atmospheric CO2 could increase owing to a rise in temperature. Whose assumption was that? Certainly not Salby’s! Please go back and watch that portion of the video. He distinctly does not make the claim. I tried to tell you the above in an earnest manner, initially, and then in a sarcastic tone. Well, I will say that I am impressed by your response. I have, however, been through some of the comments on my post about Henry’s Law and I can’t really find where you tried earnestly to point out what you’ve tried to point out here. You should probably also go and read my post a little more carefully. Let me summarise it here. The first paragraph pointed out that there are many lines of evidence why Salby is wrong (as he almost certainly is). All my post was trying to do was show (more for my own benefit than anyone else’s, as I think I may have also acknowledged) was that it can’t be the oceans. You’re quite correct that there are other natural sources of CO2. However, they also can’t be the source of the increase in atmospheric CO2. So, I didn’t claim that Salby said it was the oceans. His suggestion is that it is natural. My post was simply illustrating why it can’t be the oceans. It also can’t be any other natural source. Just because my post is not a complete rebuttal of what Salby suggested does not suddenly mean that what he suggested has any merit. It really doesn’t, as I hope you agree. But you should be able to make an effort to understand what I said. Surely, at this stage, it cannot harm anyone? Okay, I think I now understand what you were suggesting. Salby didn’t specifically say that the source was the oceans. There are other possible natural sources. My post simply considered the oceans, therefore it isn’t a complete rebuttal of Salby (which I didn’t actually claim). However, it can’t actually be any of the other natural sources either. So, Salby is still wrong. Agree? Especially the prologue and Act Three here are worth a quick listen. Anders especially will appreciate the latter (two physicists! ), the lesson being (IMO) that no amount of civil persuasion will get through to such people. Most climate deniers who come onto blogs to argue are already far down that path. Sure, give them a thorough refutation, but shut them down when the repetition begins. IMO such ideas will die only only when their proponents do (similar to Planck’s suggestion that science advances “one funeral at a time”), and in the interim the only thing that can be done is to deprive them of a venue. I suspect one of the reasons denial in general seems to have gotten more traction in the U.S. is the sheer size of the place, making it possible for people on- and off-line to seal themselves off from other influences. Anders, the experiment might have worked better if you had been the one announcing it and if Willard had been able to resist trying to impress everyone with the brilliance of the underlying ideas. Stating a definite end point would have been a big help too. I did notice that Doug Bostrom seems to get it. My post simply considered the oceans, therefore it isn’t a complete rebuttal of Salby (which I didn’t actually claim). However, it can’t actually be any of the other natural sources either. So, Salby is still wrong. Agree? However, it can’t actually be any of the other natural sources either. My answer to this was, and is: “I don’t know”. I don’t know enough carbon biogeochemistry to say there are no carbon sources that can ramp up with increasing temperatures to increase atmospheric CO2. I do know two things: (a) if there were significant sources, we would have seen them described (b) there are actually processes that could conceivably take part in the carbon cycle in short timescales (multidecadal) with increase in temperature. For instance, it is repeatedly described that the cold tundra and North American landmass could become more ‘biologically active’ with increasing temperatures warming high latitudes. More soil that simply lies icy and dormant can start to sustain life and give up their ‘locked carbon’ for cycling. With methane, this is already described, and I linked to a Nature paper on your blog. Now,whether such processes would result in a net carbon ‘source’ or ‘sink’ – I don’t know. Every time I look at papers there seems to be contradictory hypotheses. At least during the period I looked at the literature on the Amazon, that is how it was! Note no significant CO2 spike during mid-Holocene warming, Shub. Previous interglacials and the Pliocene also indicate not. FYI the Amazon situation has now been ground-truthed, rendering that model result questionable. Why not try reading Tom Curtis’s 10 lines of evidence. I really don’t think there is any real doubt that the rise in atmospheric CO2 concentrations is anthropogenic. It really can’t be anything else. Theresphysics, when you say “however, it can’t actually be any of the other natural sources either” for a temperature mediated rise in atmospheric CO2, I expected a categorical presentation of why that is true. Not Tom Curtis’ Top Ten Reasons for Anthropogenic CO2. You do realise, at that point, we were discussing a specific point in your inductive reasoning. Giving me reading assignments that have nothing to do with the question weakens your argument. Anyway, if you are sure there are no other possible natural sources of anthropogenic CO2 with increasing temperature ( like recruitment of dormant high-latitude soils and poleward extension of ecosystem boundaries), then so be it. Don’t tell me you proved it though. Steve, if you follow Salby’s argument, his claim is the ice core records fail to capture high-amplitude variability of CO2. Again, his claim, not mine, just so we remember it. It follows that there might have been higher CO2 spikes in the past the ice proxies failed to preserve. NH high latitude warming = more boreal forest = increased CO2 drawdown. Salby is so wrong it hurts. You should not waste your energies defending garbage. Spikes, Shub? The periods I mentioned weren’t generally spiky. A “spike” that lasted very long will have had effects outside the ice cores, especially in the Arctic and boreal (as we are seeing now). As BBD implies, the northerly extent of the boreal forests is one of them. Sorry, but this is just silly. It really is us. The evidence is overwhelming. If you can’t even accept this, then you truly are a lost cause and I am absolutely wasting my time discussing this, or anything else related to climate science, with you. Therephysics, you say “It can’t be anything else” but you cannot provide support. Wave your arms and make arguments from incredulity – it doesn’t impress. Steve, “As BBD implies” doesn’t do much. BBD will imply anything. [<—Mod: You're skating very close to the edge here, Shub] You are right that spikes that last long will, or should show up in ice proxy records But, Salby’s claim is that high-amplitude short-timescale peaks will be tamped down. And, why does it have to be constantly and predictably so? Again, remember, these were Salby’s arguments. At the time, I pointed out that (a) Salby’s claims were unpublished in full form, and, (b) I felt secure enough in my acceptance of the standard paradigm (about anthropogenicity of CO2) to examine his hypothesis. Salby has to publish his paper/s fully for us or anyone to dismiss it. Otherwise, it doesn’t even measure up to the effort! BBD, the equation is not as simple. Large carbon-drawing forests thrive well under conditions of increased atmospheric CO2. Read the 10 lines of evidence that I linked to in an earlier post. It’s all there. The only thing that is consistent with all the signatures is that it is anthropogenic. Also, if it’s not us, where are our emissions going? They can’t go into the oceans because that’s what I illustrated in my post. The only other major sink is the biosphere, but you seem to be suggesting that that is also the source. How can it both be a source and a sink? Also, if it is the source how do you explain that change in the carbon-14 ratio? Magic by any other name. When did I say they didn’t? More irrelevant waffle. Salby has to publish his paper/s fully for us or anyone to dismiss it. Salby’s claims are in the public domain and can be critically examined. Ice core expert Eric Wolff did so at the time. He was able to show that Salby’s claims were mistaken on every point. It’s an echo chamber regardless unless it has some sort of direction. That the echoes are more or less dissonant is somewhat beside the point, except insofar as too much dissonance reduces participation. Clarification: There’s nothing at all wrong with echo chambers, as people have a need to socialize with the more-or-less like minded, or in the case of the more dissonant echo-chambers with those having similar interests. But it is curious when venues with a stated or implied greater purpose end up being just echo chambers. Notwithstanding all this, I don’t think that the social psych work on denial should be verboten. Editorialize to your heart’s content about denial; don’t use it as a direct accusation. In other words, learn to distinguish “you’re in denial,” which is a diagnostic, with [platitudes like] “denial starts with minimization”. Beware, though, that this also applies to alarmism. Everything you do and say will be used against you. Let’s see if you can win the “denial!” / “alarmism!” arms race. As long as it helps move the ball forward, I could not care less. Willard enjoys playing the ref (double meaning intended) too much for me to waste my time further in threads he controls. But re the arms race bit, I might respond: And then there’s physics. On some level, Willard seems to be in denial about the nature of the problem. Imagine that. And of course simply arguing about denial vs. alarmism (which lack symmetry anyway) isn’t going to move the “ball” forward anywhere except perhaps in Willard’s head. 74 comments! I guess if the discussion moves here, that is an indication that Willard is moderating too strictly. (I did not read the threat at ATTP.) The aim of reducing the amount of personal attacks and focussing more on the science is good, but hard to maintain outside of the scientific literature, where the authors think over their arguments many times before publishing them. In my opinion, Willard’s recognition of, and labeling the debate as “ClimateBall” is a metaphor for Football of any kind. It brings thousands of spectators to the stadium. Some degree of conformity to rules must exist and some effort must exist to keep it *interesting*. In soccer (futbol), a rule exists called “offsides” that prevents opponents from scoring too easily and defeating the excitement of the battle. The game must exist and it must be consistently exciting and interesting as otherwise only family members would come to the stadium (and you would not build a stadium anyway). It must also resolve “who is better” which is a proxy for “who is correct” which is a thing that right now is simply not knowable for nearly every citizen of Earth. I suspect a scientist would find this as bizarre as detecting devils by drowning you. If you die, you were innocent. If it becomes about a particular player rather than the game then it has drifted. It may still be interesting but no longer advances the topic at hand.